In a reference to Doraemon, Japan's most famous animated robotic cat, a Chinese person once remarked: "Lazy is the person who relies on robots in times of need." Though there may be some truth to the statement, it ignores Japan's long-held notion that robots (and their animated counterparts, such as Doraemon and Astro Boy) exist primarily to bring happiness to humankind. Many suggest that the development of robot manufacturing in Japan is built upon the strength of this affection. The affection toward robots can be traced back to the karakuri mechanical dolls of the Edo period. 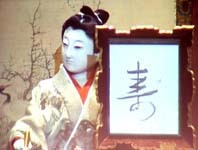 One such doll is the mechanical "calligraphy writing doll," considered a masterpiece of karakuri craftsmanship. Recently returned to Japan after a long absence, the doll was constructed more than 150 years ago by Tanaka Hisashige, who is often referred to as the "Edison of Japan" and who served as a technical advisor for the Nabeshima feudal domain. The "calligraphy writing doll" resembles a young man holding a brush in his right hand. With a series of movements fully controlled by precise automatic mechanisms, the young man dips his brush into ink and draws the kanji character for kotobuki ("blessing" or "longevity") on a sheet of paper in front of him. When finished, he seems to display a look of satisfaction to his onlookers. Science historian Higashino Susumu (55), who recently succeeded in his 13-year effort to persuade a wealthy American collector to sell the prized karakuri back to Japan, is amazed by the sophistication of the restored doll. Mechanical dolls capable of writing were also made in China and Europe, but unlike this Japanese masterpiece, their pens had to be dipped in ink beforehand or they only moved from the elbow down -- thus, they remained confined to the realm of crude puppetry. Hisashige imbued his creation with a sense of reality, such as in the human-like way he follows the brush stroke with his eyes as he writes. "Hisashige's aim was not to create a doll, but to create a human," says Higashino. This uncompromising precision in Hisashige's work embodies the manufacturing spirit that has underpinned the development of postwar Japan. Later in life at the age of 75, after the Meiji Restoration, Hisashige founded the engineering company that would later become Toshiba. And so it was, the Japanese manufacturing industry had its beginnings in Edo craftsmanship that was uniquely Japanese. Check out the Youtube video of the calligraphy writing doll in action.